The MH series 4 roll plate bending machine has been refined over the years through extensive research and development and is considered one of the finest plate rolling machines available on the market worldwide. The 4 roll machine is the easiest, quickest, rolling machine to operate thanks to its ability to pinch the plate between the 2 central driven rolls, prebend the leading edge, and rolling the body of the part along with the trailing edge all in one direction and in one pass. There is no chance to lose the position of the plate due to being pinched at all times during the rolling cycle, which makes the 4 roll the only machine perfectly suited to be controlled by a NC or CNC control. 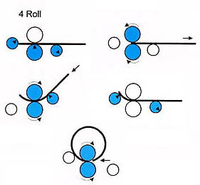 When rolling with a 4 roll machine one of the most important aspects is the ability to maintain a perfect parallel of the lower central pinching roll. The lower roll on the MH 4 roll is raised and lowered by rotating an eccentric bar located beneath the lower roll. Since both ends of the roll are being lifted by this one piece eccentric bar it is impossible for the lower roll to be moved out of parallel. Other manufacturers are using a series of complex and expensive hydraulic circuits and multiple encoders to control oil flow to 2 separate cylinders pushing upwards to keep a theoretical parallel. The ability to hold the roll parallel is lost if anyone of these separate components fail. 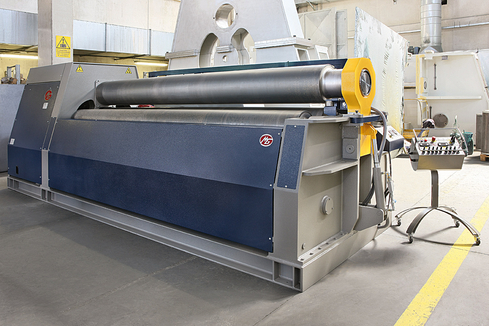 Side roll parallelism is also maintained by a torsion bar system which connects both ends of the roll together, again eliminating the need for extra encoders and hydraulic circuits with higher failure rates. The 2 central driven rolls are rotated by hydraulic motors and high efficiency planetary gearboxes coupled directly to the rolls. This along with the rolls being mounted in low friction sealed bearings greatly reduces the torque lost by clutches and synchronization systems used on other machines. The side rolls are raised and lowered on planetary swing guides with updated geometry which eliminates the far less efficient rectilinear gib and way systems. This allows us to power the hydraulic pumps with a smaller more efficient electric motor which can represent a substantial yearly energy savings without sacrificing machine power or speed. Typical bending steps on a 4 rolls machine. Our machines have been designed to work many years without maintenance. This also thanks to the well-known strength of our hydraulic systems. Furthermore, special manual distributors and valves allow us to have infinite variable speeds on all movements. Such a characteristic is very important in some phases of bending.